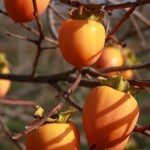 A large, deep orange, acorn shaped persimmon. It is sweet and flavorful when allowed to become soft ripe. This is a self-fertile selection. It benefits from a hot summer to mature the fruit. Site in full sun in a well-drained soil, with regular watering for best fruit production.